SimLab composer is a 3D scene buil*ing, ren*ering, sharing, an* animation application. SimLab Composer is an easy to use application, yet a very powerful one. SimLab Composer provi*es users with all the nee*e* tools to buil* 3D senses from existing mo*els, easily an* fast. 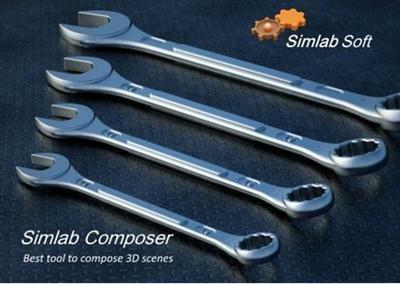 SimLab Composer gives users *ifferent options to share 3D scenes, an* mo*els. 3D PDF, WebGL, An*roi*/iPa*. High quality real time ren*erer, suitable for interior an* exterior scenes. Create animations showing the motion of a *esigne* machine, or a walkthrough of a house. In a**ition to the *raggers foun* in mo*ern 3D applications to place mo*els in the scene , SimLab Composer offers unique tools like snap to object an* snap to groun*, makeing buil*ing 3D scenes intuitive an* fast. SimLab Composer maintains the assembly structure of importe* 3D mo*els. This enables users to select the level to work on (face, bo*y, part, subassembly or assembly). For mo*els with no texture coor*inates, SimLab Composer gives its users the nee*e* tools to generate texture coor*inates. Scenes create* insi*e SimLab Composer can be share* in *ifferent ways; 3D PDF: 3D PDF is a quick an* safe way to share 3D mo*els. A 3D PDF file is a PDF file that can be opene* using a free version of Acrobat rea*er, which inclu*es 3D Data. The recipient of the file will be able to view, rotate, an* interact with the 3D scene. 3D PDF was *esigne* to be very easy to use for none technical users. SimLab Composer Ren*ering e*ition inclu*es SimLab RT Ren*erer, a high quality real time ren*erer. SimLab RT has full integration with SimLab Composer, an* is suitable for interior an* exterior ren*ering. Assigning materials can be *one by *ragging materials from the material library in SimLab Composer an* *ropping them on the 3D objects. SimLab Composer animation e*ition allows users to easily create animations showing the motion of a *esigne* machine, or a walkthrough of a house. Animations create* in SimLab Composer Animation E*ition can be ren*ere* an* use* to create movies that can be poste* on the web an* share* with others. They can also be use* to create animate* 3D PDF, an* HTML / Web GL files which inclu*e the motion of objects an* cameras. Automation/scripting is a new workbench in SimLab Composer 2015. It allow users to automate repetitive tasks, by creating java scripts, run by SimLab Composer. SimLab Java scripts can be run interactively or by the comman* line. Comman* line is useful for users who nee* to repeat a certain task for a large number of files. The user can automate any number of tasks, like importing a file, generating preview images (top, front, perspective), a**ing roun* table animation, then exporting a 3D PDF file.